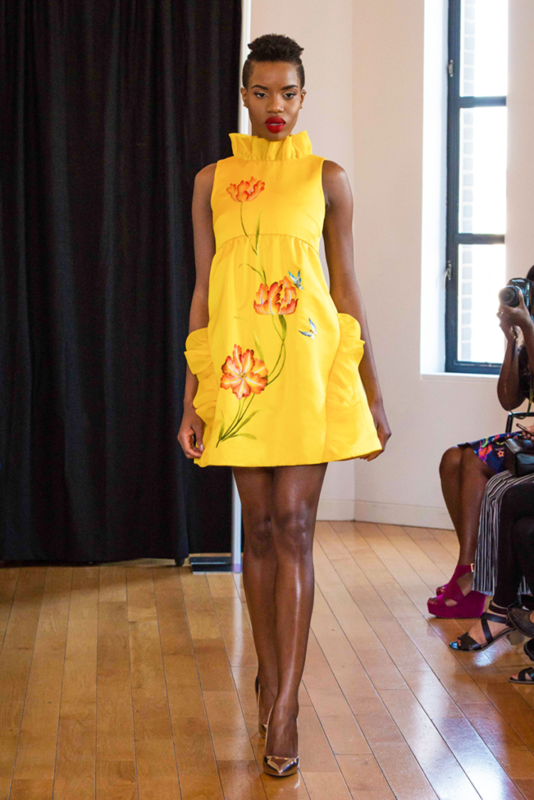 Transformation was the name of this collection and indeed, it’s a fitting sentiment for lawyer-turned-designer, Nancy Tran, who debuted this season. The well curated collection consists of day and cocktail dresses, evening gowns, and separates rendered close to the body with fitted waists and skirts tapered like tulips or voluminous roses in full bloom. The butterfly and floral motif is further evident in the couture level details of cascading embroideries, prints, pleats, and cutouts that add rich texture and depth. The line is crafted from the premium silks in creamy tones and opulent shades of scarlet, pink, purple, and yellow to capture the delicate flourish of both fashion and nature. Hemlines range from asymmetric to at, below the knee, and floor length gowns. “When a woman wears the line, I want her to feel as sensational as she looks, to unleash her own potentials, whether it’s the resolve to become her best possible self, the confidence to command attention, or the delight in celebrating a moment of being beautiful,” adds Tran. The entire collection is manufactured with the rigorous standards of quality and imbued with an international flair that makes it equally at home in any of the world’s capitals.